Design your own Tempbadge ID card with your custom Business Logo and Photo. 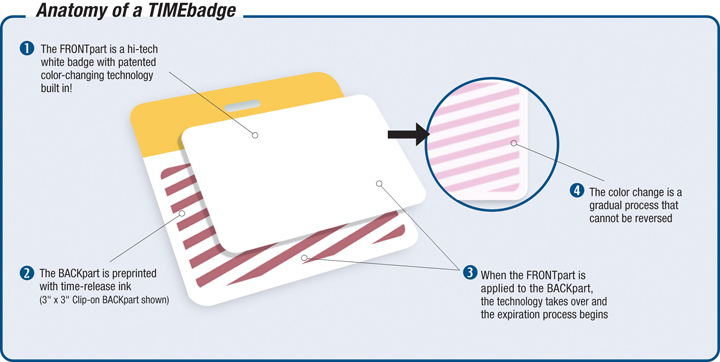 Each TIMEbadge consists of a specially coated white adhesive FRONTpart and a BACKpart that is pre-printed with time-release ink. Once the FRONTpart is applied to the BACKpart, the TIMEbadge is activated. The result is a gradual color change that signals expiration when completed. Depending on the expiration period you choose, the TIMEbadge will remain white for the majority of that time before the color change begins. For example, a One-Day Expiring TIMEbadge issued in the morning will reveal light pink bars by late afternoon, and darker pink bars within 1 day, signaling an unmistakable visual expiration. The Expiring TIMEbadge is not affected by light, so the expiration process works indoors and outdoors, day or night. Once a TIMEbadge is activated, the expiration process cannot be reversed. It is impossible to separate the FRONTpart from the BACKpart without visibly damaging the badge. The adhesive FRONTpart is made of a specially coated material that looks like paper, but is tear-resistant and durable. Even if an attempt is made to separate the two parts, the TIMEbadge will continue to change color. Why use an Expiring TIMEbadge? TEMPbadge ID Products - Any other badge is just a label!